True enough, a slight hint of yellowing in the bush, but I would image we are still weeks away from peak color here. In 2008 I drove through this area a week before the end of October and it was just nearing peak color then. Will it be earlier this year? I’m assuming these are aspens (I’m pretty much a tree illiterate). Pretty nonetheless. I ran across considerably more color on the stretch of HWY 299 between Willow Creek and Blue Lake. Unfortunately, I didn’t get any photos. 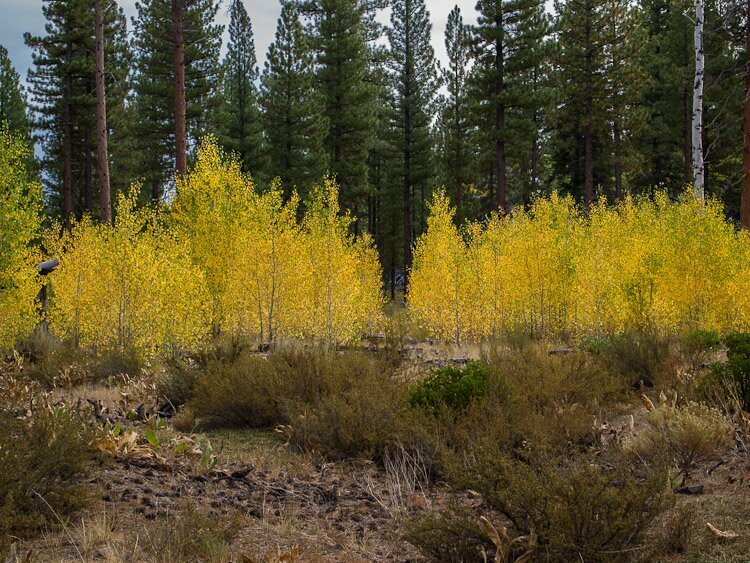 To conclude: some signs of early color in northern California in patches. Sign of an early season for peak color? Perhaps. Who knows. Perhaps after a dry, warm summer, winter will come early this year and the more prescient trees and bushes are getting ready. Last summer we saw fall color coming late, and winter didn’t strike the higher altitudes until November.